This series was probably the most beloved radio program ever. Difficult to describe, it was neither a soap opera or a comedy show - a little of both. The Gooks, Vic and Sade, were ordinary people living in a small mid-western town. Vic was an office worker at a local plant; Sade, the housewife. Completing their household was their adopted son, Rush (later Russell). Later on Sade's relative, Uncle Fletcher joined the group. The Gooks were happily married, faced no challenges, no tragedies - they just experienced events that were both bizarre and hilarious. 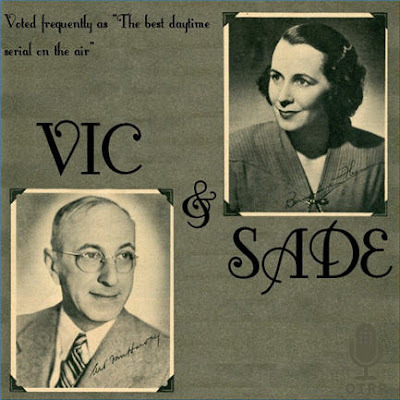 Vic and Sade began in 1932 and lasted as a daily serial-type show for 14 years. When last heard in 1946 the show went to a 30 minute format but this was short-lived, and then, alas, the end. 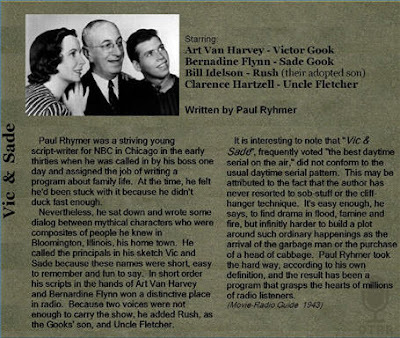 Paul Rhymer, the creater/writer, was extremely prolific and was responsible for all the writing. 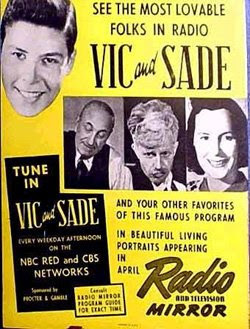 Vic and Sade was one of the greatest comedy programs of all time. To give one an idea of what this was all about just think of the "nothing" concept of the Jerry Seinfeld show - some every day events about nothing with topics ranging from shopping at the local department store; just sitting on the back porch, talking; watching a man learning how to smoke a cigar; drawing a mustache on a sleeping guest with a pencil; a horse that died; and on and on.